Entering the elite group of dry shampoo users can be daunting. Where do you start? Which shampoo is the best? What should you wear now that you will be shampooing with your clothes on? There is a lot to consider. While we can’t help you with your wardrobe, (you look great, by the way), we can help you choose the best dry shampoo. We have scoured the endless array of product reviews, interviewed professionals and dry shampoo users to find the top 3 best dry shampoos! The factors we used to compile this list include, user reviews, recommendations by stylists, price, and size of product. Bumble and Bumble have some really great products, but perhaps their best product is their line of dry shampoos. Specifically, their Pret Powder. Their Pret Powder (which expert stylist, Alana Bevell, recommends) is priced around $20. Although on the expensive end, most people say that this is the best dry shampoo on the market. Don’t be alarmed by the size of the bottle! It is small, at just 2oz! However, a little goes a long way. The users we interviewed said that although the powder is white, it did not leave a white residue in their hair. 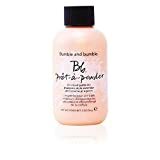 What do we like most about the Bumble and Bumble Pret Powder? The smell. In our article, 4 Tips When Using Dry Shampoo, we discussed adding scent to your dry shampoo regiment. However, the Pret Powder already has a light and fresh scent that not only leaves your hair looking and feeling great, but smelling great too! GetGoodHead.com Tip: If you are worried about white residue in your hair, check out their colored powders. Davines Hair Refresher Dry Shampoo is a spray and not a powder. $37 will get you a 3.13oz bottle. Some users said that they noticed a white residue in their hair (specifically, their roots). When using Davines Hair Refresher, make sure you read the directions on the bottle! A dry shampoo spray should not be used like a hairspray. For best results, start with small amounts, comb/blowdry, and repeat if necessary. Eventually you will learn how much you need to refresh your hair. To see how to use dry shampoo, check out this video. Like Bumble and Bumble, Davine has a very fresh after scent. The scent is similar to the smell you get after shampooing your hair in the shower. The Kenra Platinum Dry Shampoo is the largest and cheapest bottle on our list. With this link, you can get a 5.0oz bottle for under $15! Now, that is a deal! Like the rest of our list, Kenra Professional has a phenomenal scent that users are constantly talking about. About 60% of dry shampoos have a portion of users complaining about the white streaks left in their hair. Kenra users state that they don’t experience any white streaks in their hair when using the product. So, if Kenra is so great, why is it priced so low? It would be nice to think that it was because Kenra wanted to give their customers a great product at a great price, but the truth is, it does not work as well for all people. Certain hair types or structures don’t respond as well to Kenra Professional as others. Bumble and Bumble and Davines seems to work for a larger number of people, while Kenra works for most, but not all. If you are one of the lucky ones that has hair who just loves Kenra, then great! We suggest starting with Kenra, because of the low price, and then go from there.